Blue, Red, Burgundy and newcomer, Mulberry, were finishing their food when Pink arrived after a long drive from the north-east. While he was waiting for his food he opened a very special present Red had brought back from Spain for him. Pink and Blue have quite a few games and for various reasons there are one or two that they have multiple copies of. However, there is one game that they have many, many copies of. Ironically it is a game Pink doesn’t even like playing very much, and yet, it has become a bit of “a thing” that every time Pink goes to Essen he comes back with yet another copy (ideally in a different language, but often just another German copy). Red has strong opinions about this particular game though, and believes that by far the best language to play it in is Spanish, so kindly brought Pink a copy back from Spain to add to his burgeoning collection. As he began to unwrap it, Pink took a few moments to realise what it was, but was really touched by this very special gift of Bohnanza. There wasn’t time to play it before food arrived, then everyone else was turning up and the “who’s going to play what” debate began. The “Feature Game”, Keyflower with the Farmers expansion had been Pink’s request and Keyflower is one of Blue’s favourite games, so they were a bit of a foregone conclusion. They were quickly joined by Burgundy who is also very fond of the game, and Ivory who was keen to see if the expansion changed the balance and the strategies available. Since that was likely to be the long game, they got on with it while everyone else sorted themselves out. Keyflower itself is not a complicated game mechanistically, though it has an awful lot of depth. 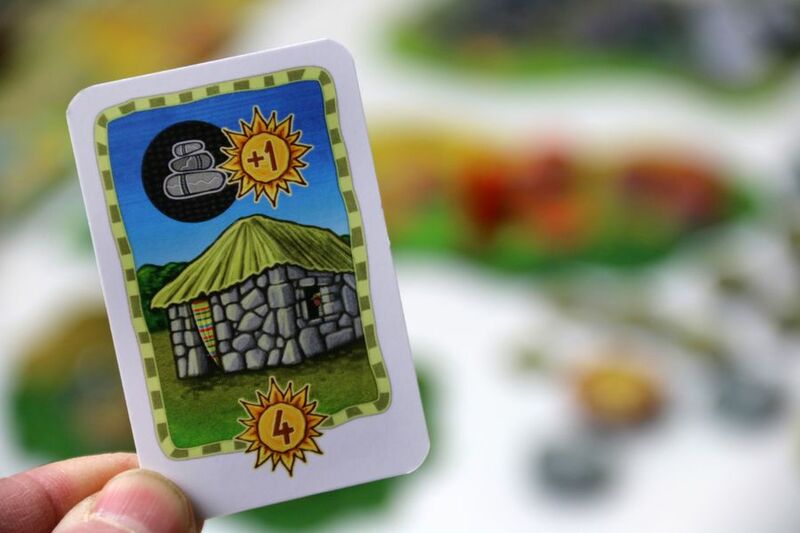 Over four seasons, players are simply taking it in turns to bid for tiles to add to their village or use tiles available in the villages or the central display. 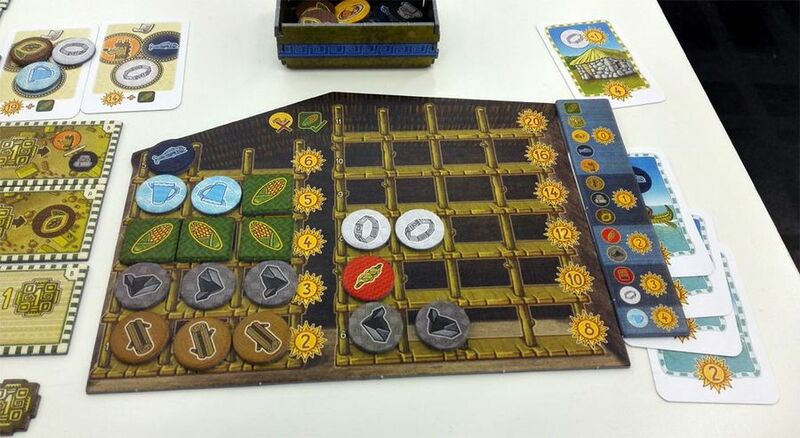 The clever part is that bidding and using tiles are both done with meeples as currency and players must “follow suite”, that is to say, use the same colour if the tile has already been activated. In Keyflower, the depth is generated by the actions available on from the tiles and their interaction, added to the fact that except when playing with a full compliment of six, only a subset are used, and these are drawn at random. This means that one of the most important aspects of game play is to keep as many options open as possible since everything is likely to change in the final round. This is not only because some tiles don’t appear, but also the fact that there is always someone who will make it their business obstruct even the best laid plans. Thus it is vital to have at least two ways ways out. Adding The Farmers expansion exacerbates this as it introduces lots more tiles so each one is less likely to be revealed. This is a potential problem when trying to “play with the expansion” as it is perfectly possible that none of the Farmer tiles are introduced into the game. To prevent this, some tiles were drawn explicitly from the Farmers set. 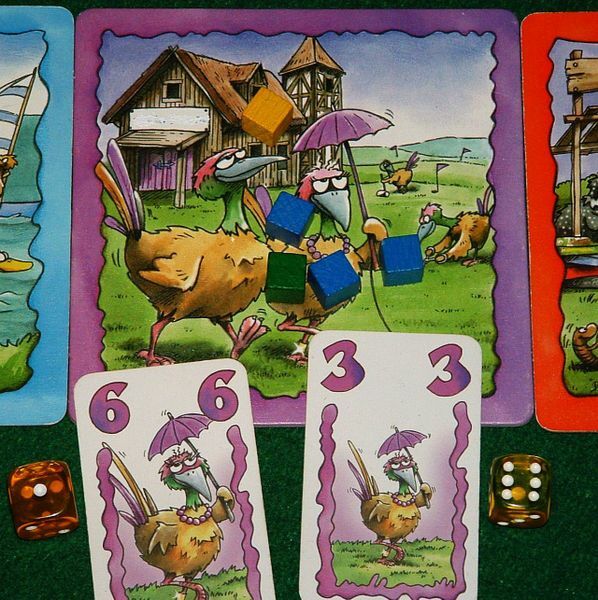 The Farmers expansion doesn’t change game play much, it just adds depth by the addition of farm animals as another means to score points. The idea is that animals are kept in the fields that are formed by the roads in a village. Each field that is occupied scores points depending on the type of animal or animals in it. Thus each field with sheep in it scores one point, each field with pigs scores two and each with with cows scores three points. These scores are increased for villages with special tiles, like the Weaver, which increases the sheep score to three per field. Animals in a field another of the same type breed at the end of each season and can be moved in a similar way to resources. 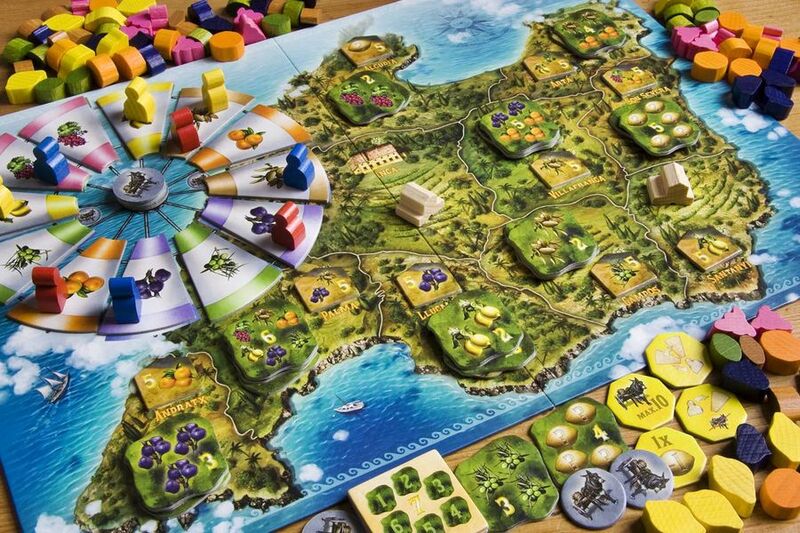 The expansion also introduces Corn to the game, which allows players to enhance their movement actions. 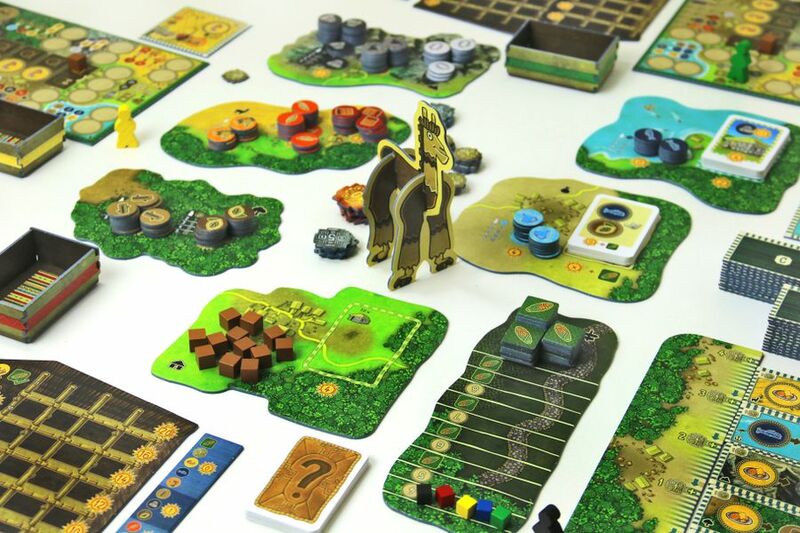 Otherwise, the game with the expansion plays in much the same way as the basic Keyflower game, takes a similar amount of time and requires a similar blend of tactical decision making and strategic planning. Meanwhile, everyone else had divided themselves into two groups of three and had begun to play. Pine joined Red and Mulberry in a game of Finca. Pine had played it before, but a long time ago so Blue took time out from setting up Keyflower to explain how to it worked. It’s a very simple game of set collection with beautiful wooden fruit that’s now nearly ten years old. At its heart is an interesting rondel mechanism. 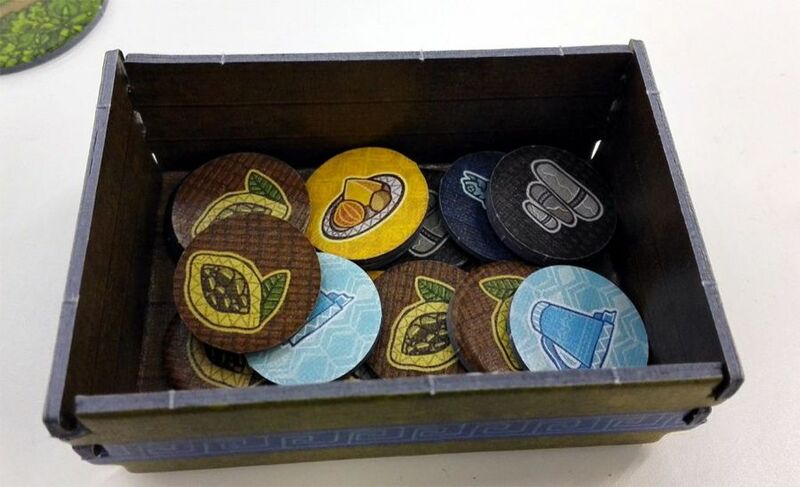 On their turn, players choose one of three possible actions: move around the rondel and collect fruit; use a donkey cart to deliver fruit; or carry out an action with one of the special, single use tokens that each player starts the game with. There are some lovely features about the game. 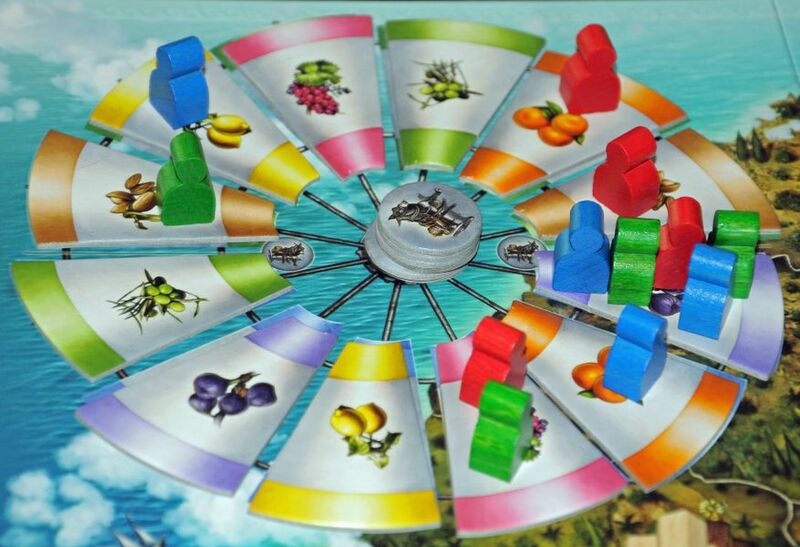 For example, players move as many spaces round the rondel as there are workers on the space they started on and the number of fruit they get depends on the number of workers on the space they finish on. As players have four workers each, there are lots of factors to consider when choosing which worker to move. Investing wisely is the key to the game, and Pine went for variety while Mulberry specialised more, particularly in figs and oranges. It was the figs and oranges that won the day with Mulberry finishing with fifty-one points, just four ahead of Red who’d had lots of fruity fun with Finca. With that finished, Red spotted Yardmaster in a bag, one of her favourite games, and decided to introduce Mulberry to it. It is quite a simple game and was described by Mulberry as “UNO with trains”. Players are building a locomotive by drawing cargo cards and using them to buy railcar cards from the four face up cards in the middle. The game was very close, but it was Red’s experience that was key, giving her a two-point winning margin over Mulberry in second place. With that done, they moved onto another old favourite, 6 Nimmt!. 6 Nimmt! gets played a lot, but it’s unusual that we play it with so few players. 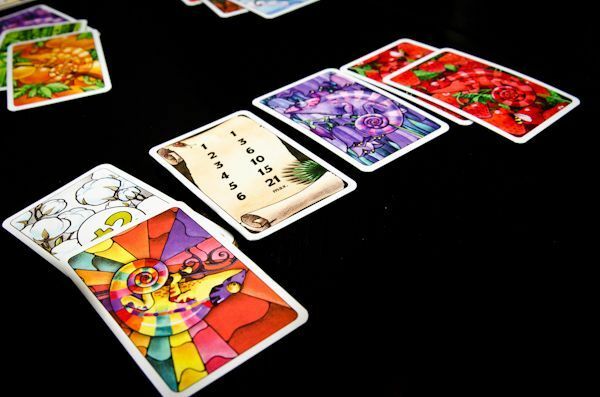 The idea is that everyone chooses a card and then players add them to one of the rows, in ascending order adding them to the row ending in the highest card that is below the card they are playing. 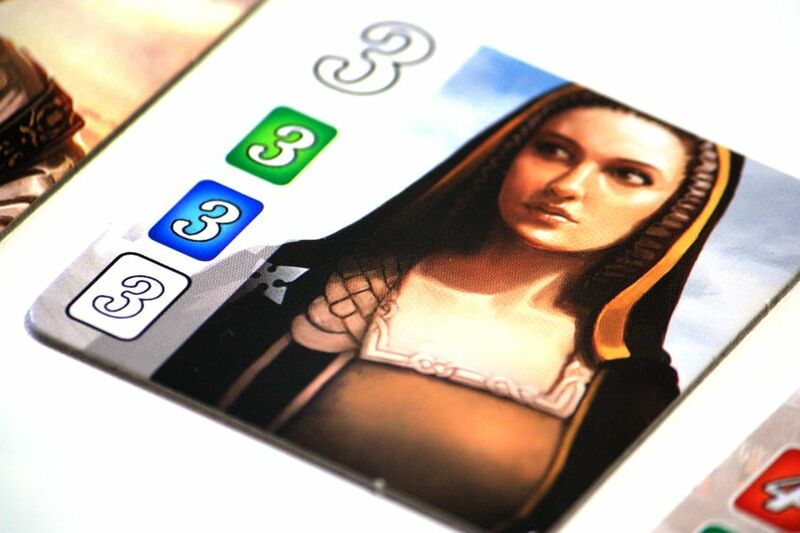 The catch is that when a sixth card is added to a row, that player picks up the first five cards. The game really is at its best with more players where the simultaneous card selection adds mayhem. They just played the one round; perhaps Mulberry misunderstood and thought the idea was to collect “nimmts”, but either way, she top scored with twenty-one – quite an achievement with only three players and only one round! Red did rather better and finished the winner with just two “nimmts”. On the neighbouring table, Green had joined Black and Purple and they started out with this year’s Spiel des Jahres winner, Azul. 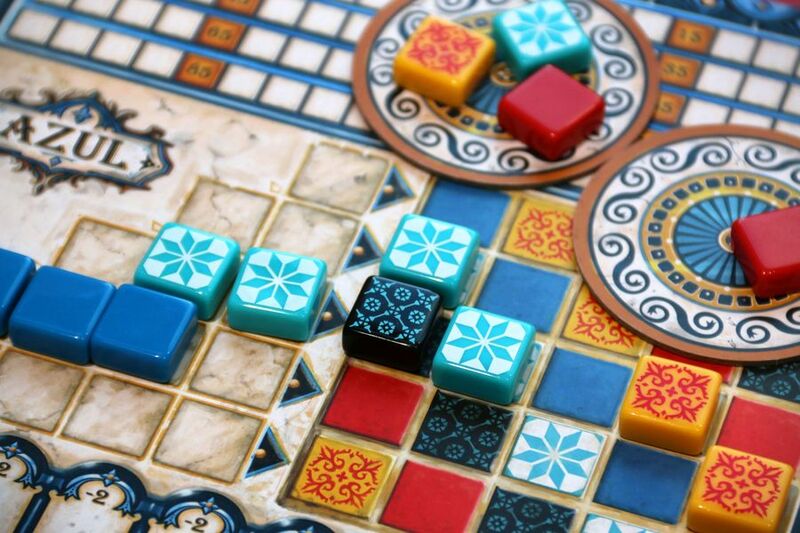 This is a really an abstract game with only a loose theme of tiling a palace, but unusually, nobody seems to mind and we’ve played the game a lot with multiple copies in the group. The game is really just a set collection game, similar to Finca and Yardmaster, but with an added spacial factor as tiles have to be placed to score points. Tiles are chosen from “factories” with those that aren’t taken going into a central pool. Since players can only take one colour at a time and must always take all the tiles of that colour in that location, they can easily end up with not quite enough, or even too many scoring negative points. Although it is not really an aggressive game, it is remarkable how much damage players can do to each other. Landing too many tiles is bad, but it is arguably worse to get “not quite enough” as it inhibits options in the next round too and therefore can affect the whole game. 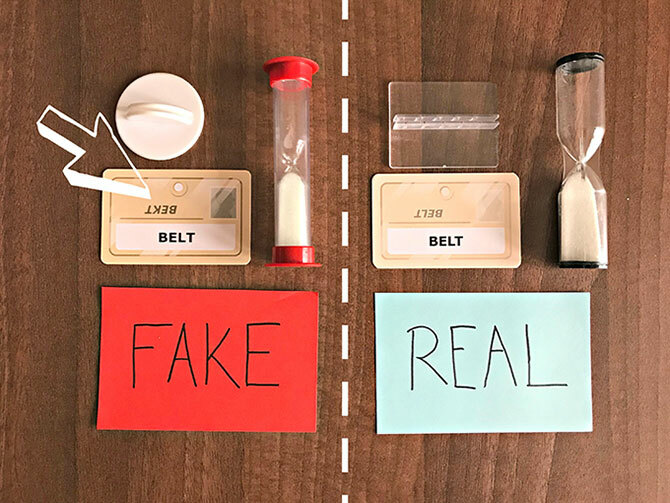 As we’ve played it a lot, we all have a good understanding of how to play, so unless someone gets things very wrong, games are often close, making them quite tense affairs. This was no exception, with Purple just taking the honours with sixty-three points. To alleviate the stress of Azul, the trio moved on to play Om Nom Nom, a light “dice-chucker” This needs a similar sort of double think to 6 Nimmt!. 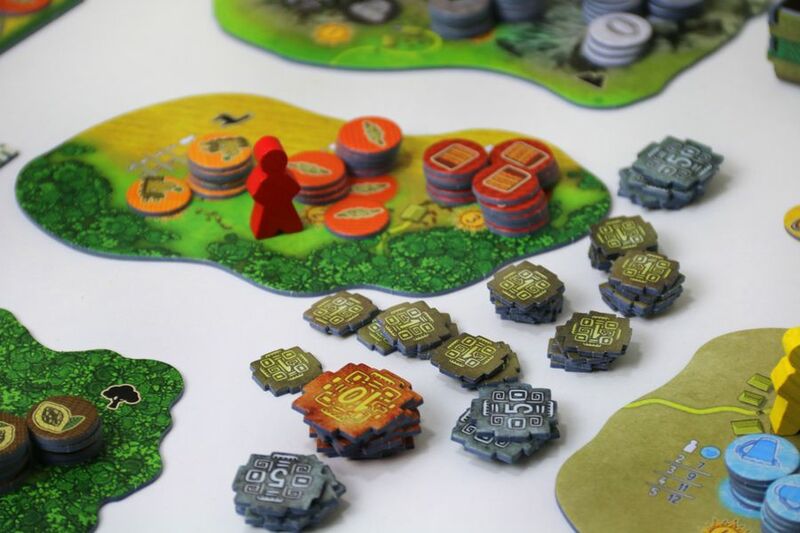 The idea is that the board is seeded with dice populating the lower levels of three separate food chains. 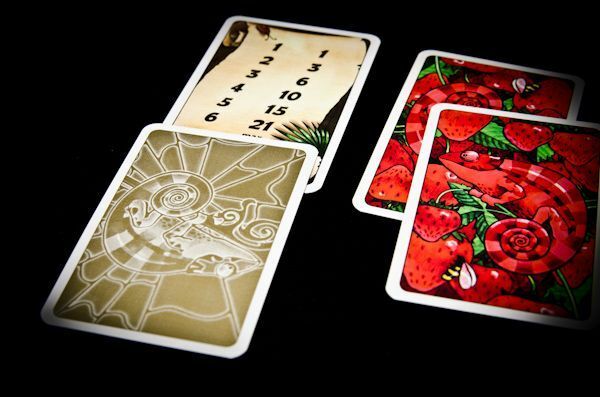 Then players simultaneously select an animal card to play, populating the higher levels of the food chains. The idea is that cards played at the top of a food chain will eat those immediately beneath it. 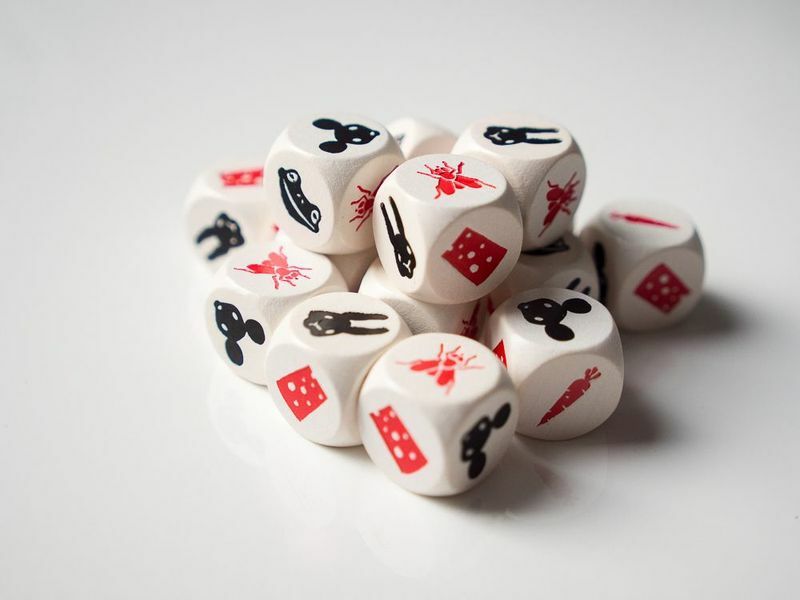 So if there is a juicy bunch of carrots rolled, is it best to play the rabbit and risk getting eaten by a fox, or is it better to play a fox and gamble on everyone else being tempted to play rabbit cards? Often the wisest move is not to get involved, but if everyone adopts that approach, the carrots get left and everyone is now playing in the more confined space of two food chains. Sometimes the game is very tight, but this was not one of those times. Black took five cheeses in one round and finished some twenty points ahead of everyone else. 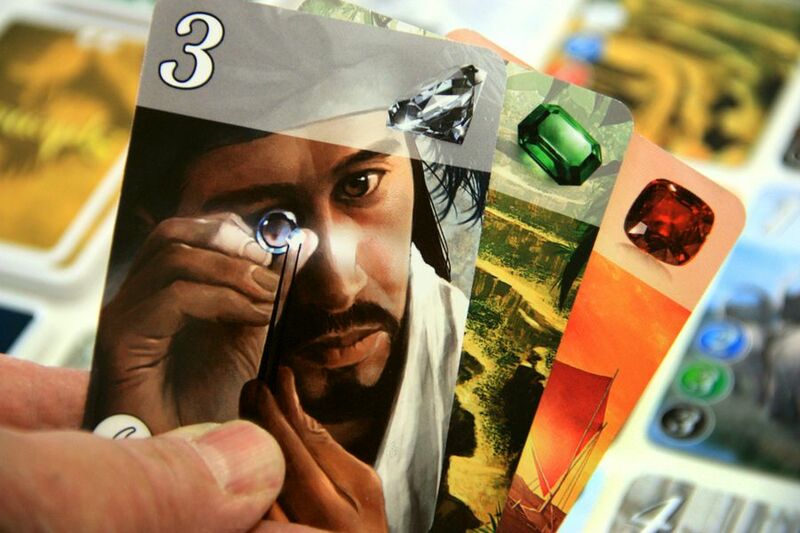 The other games were still going and nobody fancied anything particularly taxing, so after a brief hiatus, Splendor got the nod. Yet another set collecting game, it is also very simple and surprisingly popular in our group. There is a remarkable amount of thought necessary for the apparently simple choose three different tokens or buy a card. Many people seem to think it is a trivial game, but for us, it has the right balance of strategy and tactical thinking to make it the perfect game when people are tired but still want something that provides a little bit of interest. We’ve played it a lot, and almost inevitably, Burgundy wins. One of the factors in choosing the game was the guarantee that he wouldn’t win this time as he was engaged elsewhere. In the event, it was another close game, with Green and Black very close to finishing, but Purple just getting to fifteen points first and ending the game before they could catch her – her second win of the night. We were about an hour into our respective games and Blue was concentrating deeply on her next turn in Keyflower, when her village was suddenly and unexpectedly improved by the addition of a very fine chocolate cake complete with candles. Much to her embarrassment, it was also accompanied by singing. There was a brief interlude while Blue blew out her candles and cut up the cake, admired her quite a-llama-ing card, everyone consumed the really rather delicious cake (Waitrose finest no less), and Burgundy made sure there wasn’t even a pattern left on his plate. And with all that done, the games continued. Keyflower continued after cake and the strategies were beginning to become clear. Ivory, Blue and Pink were going for animals, while Burgundy’s plans had been undermined by both Blue and Ivory and was trying to make something from his very, very small village. With the arrival of Winter, players had to put in their choice of the tiles they’d been given at the start. Much to Ivory’s disgust, someone had put in the Dairy which increases the score for fields with cows in them. Since neither the Cow Shed tile nor the Ranch tile had been drawn in Autumn, nobody had any cows so the Dairy was a waste of a Winter tile. This meant there was even more competition for the other tiles, and there weren’t many of those as players can put only one tile into the mix. Burgundy got his Key Market which nobody else had any real interest in, Blue took the Hillside, but lost out on the lucrative Truffle Orchard to Pink. Ivory took the Mercer’s Guild and the Scribes after a brief tussle with Blue. It was quite tight with everyone getting points from different places and it was clear the tiles everyone picked up in the final round made all the difference. Ivory, Blue and Burgundy had spread their points about, while Pink put all his eggs (or rather pigs) in one basket, but it paid off, giving him a massive forty points and seventy-three points overall, four more than Blue in second place. Everyone had enjoyed playing with the expansion, particularly Ivory who felt it had added more depth. Although Ivory had to go, there was just time for a quick game of 6 Nimmt!, so Pine took his place and the foursome played a couple of hands. In the first round Burgundy and Pine competed for the highest score with twenty-five and twenty-seven points respectively. In the second round, Pine picked up what might be a record score of forty-five. At the other extreme, Blue managed to keep her score down to eleven, and added to the three in the first round that gave her a clear victory—just in time for her birthday at the end of the week. Learning Outcome: Sometimes a pig strategy brings home the bacon! This entry was posted in Games Night and tagged 6 Nimmt!, Azul, Bohnanza, Finca, Keyflower, Keyflower: The Farmers, Om Nom Nom, Splendor, UNO, Yardmaster on September 18, 2018 by nannyGOAT.